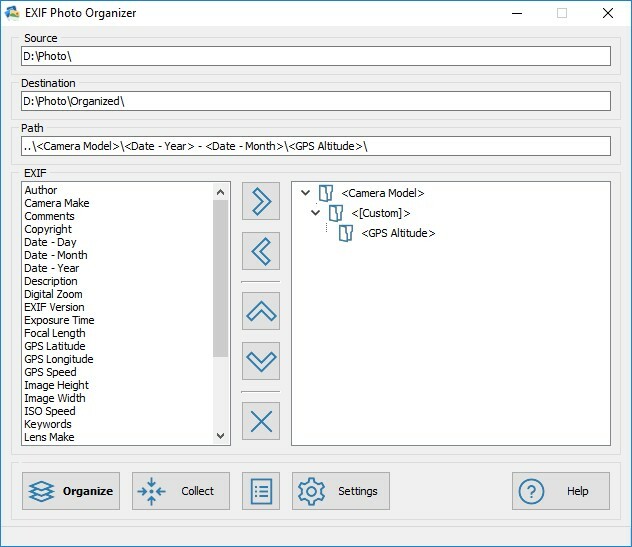 EXIF Photo Organizer can quickly and easily organize huge photo collections according to user-defined rules by using the jpg-embedded EXIF metadata that nowadays most modern digital cameras and scanners record. Currently EXIF Photo Organizer supports 31 EXIF tags that are author, camera make, camera model, comments, copyright, date - day, date - month, date - year, description, digital zoom, EXIF version, exposure time, focal length, GPS altitude, GPS latitude, GPS longitude, GPS speed, image height, image width, ISO speed, keywords, lens make, lens model, orientation, owner name, serial number, software, subject, time - hours, time - minutes, title and 4 special tags that can be combinations of any of the already mentioned tags and/or a custom text. All this means that it is possible to sort photos in separate folders by all or any of these tags.